Medieval Morsels: Portugal's national dish - dried, salted cod! My daughter has just returned returned from a beginner’s surfing holiday in Portugal. She and her friend both managed to stand up on the board by the end of day one, so that was promising! She had a whale of a time apparently. But because she was particularly taken with eating it on holiday, I want to blog about Portugal's fish and not marine mammals! Dried and salted cod - bacalhau - is the national dish of Portugal. It has a long pedigree. The Portuguese adore it and it’s said that they know 365 different ways to cook it…one for each day of the year. Reay Tannahill in her book “Food in History” remarks that Portugal, along with Spain and Scandinavia, were the “fishiest” societies that any European traveller in the Dark Ages, Middle Ages /Medieval or Renaissance/Tudor times would be likely to encounter. Woodcut dating from 1555 with large ocean going vessels. A large fishing fleet was encouraged in Medieval times because it provided employment, food resources as well as ocean going ships and trained seamen both called upon for a nation’s navy in times of war. Portugal was a maritime force to be reckoned with in those days. Normally cod - a deep sea fish - would be beheaded, gutted and salted on board for the long voyage back from the cod fishing grounds in the North Atlantic. 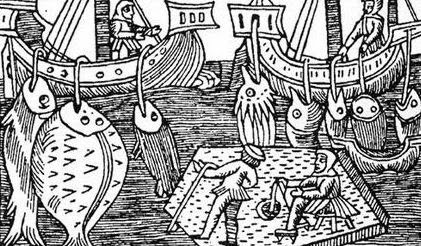 Even in the Dark Ages, preceding the Middle Ages and later Tudor times, fishing fleets from all parts of Europe would have sailed to Iceland in pursuit of Atlantic cod. Shortly after Columbus discovered America about 500 years ago, the Portuguese were fishing for cod as far away as Greenland and Newfoundland. They were the first Europeans to do so. The fish, already partially dried by salting on the voyage, landed in Portugal or Spain would be hung on wooden drying racks in the sun and heat. In Norway the cool, crisp, breezy climate would provide fish drying power of a different sort. It keeps for many months, even years this way without refrigeration. And then it requires being soaked for 24 hours in changes of water before being used to prepare a dish. The soaking reconstitutes the fish and gets rid of the excessive salt. In England it was the commercially produced Norwegian "stokkfisk" or stockfish that became the Medieval staple food reserve par excellence, traded amongst the Hanseatic League of Guildsmen operating from ports on the shores of the North and Baltic Seas. My hometown of King’s Lynn was a Hanseatic port on the east coast of England facing the North Sea and within easy reach of Norway. Here is MedievalMorsels take on fresh cod which was a rare luxury in Medieval times. A one inch scale miniature dolls house food - cod in a basket - for a historic diorama or a more contemporary fishmonger’s stall!